If you are a soccer player and you are looking to improve your athletic performance on the field then you first need to learn what your biggest weakness is. In this three part blog series, you will be introduced to speed, agility and power for soccer. By learning how to test each of these categories, you will begin to understand where you are lacking and you can focus on. The two best tests for soccer agility are the arrowhead agility drill and the t-test. 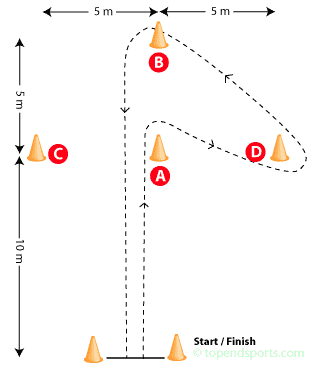 The cones are laid out as per the diagram, with three marker cones placed in a arrowhead shape, and one set of cones or line marker to indicate the start and finish line. The player starts with their foot behind the starting line in a sprint start position. When ready, they run as fast a possible to the middle cone (A), turn to run around the side cone (C) or (D), around the far cone (B) and back through the start/finish line. The player completes four trails, two to the left then two to the right (as shown). The trail does not count if they step over a cone instead of around it. Watch the video below to learn how to setup the arrowhead agility drill. Set out four cones as illustrated in the diagram above (5 yards = 4.57 m, 10 yards = 9.14 m). The subject starts at cone A. On the command of the timer, the subject sprints to cone B and touches the base of the cone with their right hand. They then turn left and shuffle sideways to cone C, and also touches its base, this time with their left hand. Then shuffling sideways to the right to cone D and touching the base with the right hand. They then shuffle back to cone B touching with the left hand, and run backwards to cone A. The stopwatch is stopped as they pass cone A. Test description and photo from TopendSports. Click here to learn more about the t-test from TopendSports. Watch the video below to learn how to setup the arrowhead agility drill for soccer. After you have tested your agility and have identified that it is a weakness of yours, you will need to improve it by performing specific drills. The below exercise is a ladder drill that introduces your body to all the varied movements possible on the soccer field. 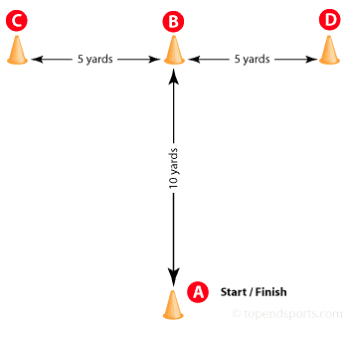 Set up 2 sets of cones or an agility ladder on the field and perform the six sets of sequences below. Watch the video below to train soccer agility.